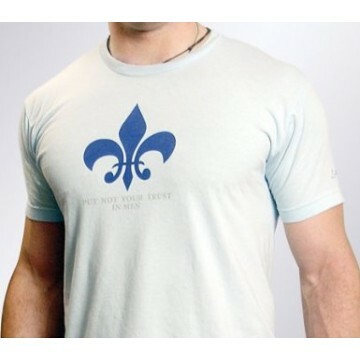 Light Blue Shirt with Navy Blue Symbol Symbol: Fleur-de-Lis. 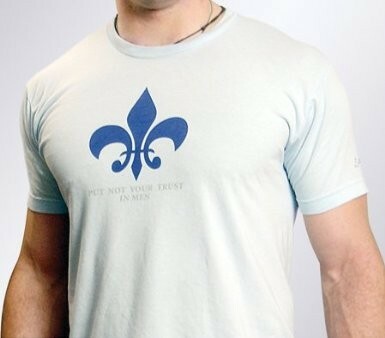 Symbol History: The Fleur-de-Lis has long been recognized as the royal symbol of Christian France. It is worth noting that the lilly flower contrasts significantly with the other armorial emblems of European royalty, such as the lion and the eagle. The symbol is also ascribed to the Virgin Mary, and the three-fold nature of the petals have been used to represent the trinity. Joan of Arc famously carried the Fleur-de-Lis on her banner during her victorious march against the English in favor of the French Dauphin. Scripture Passage: The phrase "Put Not Your Trust in Men" is a take on a scripture passage from Psalms 145:2, "Praise the Lord, O my soul, in my life I will praise the Lord: I will sing to my God as long as I shall be. Put not your trust in princes." To adjust to modern times, we have substituted the word "princes" for "men". In other words, we must trust in God above all else.